Max Wexler 1993 18 71 6768 20 minutes from Patong Beach. The Laguna Phuket Golf Club is located on the west coast of Phuket at just 20 minutes from Phuket International Airport and only 25 minutes from Phuket Town and can be easily reached from virtually all points on the island. 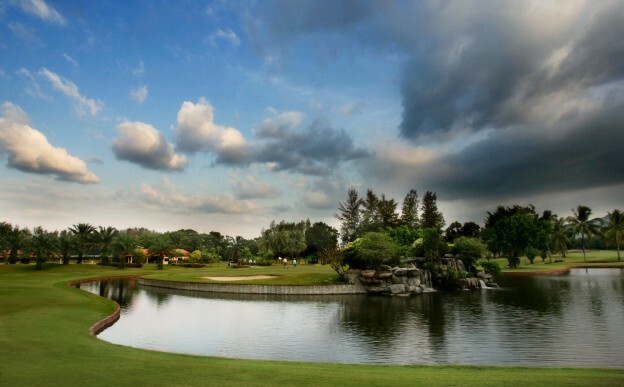 The Laguna Phuket Golf Club boasts an excellent 18 hole golf course in the beautiful surroundings of Bang Tao beach. The par 71 layout is not as demanding as some Phuket courses, but will still challenge golfers of all skill levels. The course meanders through a labyrinth of lagoons, that requires golfers to play with accuracy, and to select clubs carefully, on several holes, adventurous long hitters will certainly enjoy taking a rewarding gamble by cutting corners, while on other holes, strategic iron play is a must, the course features gently undulating fairways, large greens and a number of attractive lagoons with water coming into play on numerous holes. The Thai style clubhouse at Laguna Phuket Golf Club was voted in the Top Ten Best Clubhouses in Asia by readers of Asian Golf Monthly magazine in 2006 and will cater for all your needs, including a full range of rental equipment and Pro shop with an impressive range of leading golf apparel and accessories. The Banyan restaurant provides both air-conditioned and open-air seating overlooking the golf course, featuring a broad selection of fine Western and Thai cuisine, he Laguna Phuket Golf Club has received numerous golf industry awards and will provide a memorable golfing experience. You can entrust your work to us with no fear of being deceived because we guarantee high quality of term paper writing and money-back if it doesn’t comply with your requirements.